In 2008, Chelmsford started a town-wide history project, to index the historical records in all the various locations around town. We're still chugging along, and a volunteer found something interesting in the library's archives. This check for $1.50 was written by the treasurer of the North Chelmsford Library Association to the ALA Publishing Board in 1919. The back of the check is interesting, too. We're still discovering things in the archive, so I'm hopeful we'll be able to figure out what this check was for. 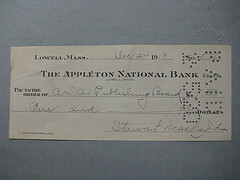 The signature on the check is Stuart MacKay, brother of Anna C. MacKay, who the Anna C. MacKay Branch Library in North Chelmsford is named after. North Chelmsford has been, and is now, very supportive of the library, and I like this continuity of history. Also interesting that he was working on Christmas Eve. Also uncovered in the archive are circulation records from the early 1900's - including every book each patron checked out. An interesting philosophical question is this: at what point do library records go from being a matter of patron privacy to a matter of historical record or curiosity? For our indexing project, we're using Past Perfect, and will be providing access through Past Perfect Online (but nothing's been uploaded yet). Until that's ready, we're using a Google Custom Search Engine to index all the existing online resources we could find. It works well enough for the time being, and I know this is going to be a long-term project, but I'm looking forward to having a real index available. Something new my library is undertaking is a Town-Wide History Project. Our goal is to create a master index of all of the historical records in town, so we'll know where different types of information is stored. Phase 2 will be preservation and digitization of as much of this as possible. Good idea? Yes. Lot of work? More than we realize. We expect this process to take years, so we're trying to start slow and small so as not to get overwhelmed. We're also trying to document everything as we go along, so we'll have a record of how we went about doing this, and when certain things were accomplished. Since other libraries might be interested in the same sort of project, here's our progress so far (I'll occasionally post updates, too). I'm told that this was tried about eight years ago in Chelmsford, but was abandoned less than a year after it started. The library was approached a few months ago to try again, and I immediately took to the idea. A comprehensive local history finding aid would be very valuable at the reference desk. In addition to library staff, we also have a volunteer who has been helping with a lot of the work. She's been responsible for most of the data entry and envelope stuffing, and will also be helping when it comes to visiting each site to do an inventory. Without her, most of these steps would have been much more difficult. To mail them, we did a simple mail-merge between Word and Excel, and enclosed a stamped return envelope. We also enclosed a list of all the groups contacted, in the hopes that the recipients will be able to suggests organizations we didn't think of. Compile the returned surveys - As the surveys were returned, we compiled the answers into the same spreadsheet we had begun. We used a different worksheet, and kept track of who replied, if the contact information had changed, and how they answered the questions. On another worksheet, we aggregated the answers for all groups, so we'd know how many map collections were in town, how many were available online, etc. At this point we have outgrown Excel, and need a database for our needs, not just a simple spreadsheet. I'm going to have to find a tool to accomplish this before the project grows more, because the less data we have to rekey, the better. Introductory meeting - We wanted our first face-to-face meeting not be a lecture by library staff, but more of a conference, where all participates in the group were equal. Library staff did lead the meeting to give an overview of what we had in mind, but once things got going the other attendees really began to take ownership of the idea and see a role for their organization. This is as far as we are in the process right now - which is to say, the very, very beginning. The consensus at the meeting (which was just last night) was to invite a speaker to give an overview on what kind of materials are historically-important, and what groups can do to prepare for an on-site inventory. The groups also wanted to see examples of what the end result will look like (for our project, we're using communities like Westford, Sudbury and Ipsiwch as models). We're going to plan that for late January/early February, and then start scheduling site visits for initial inventories. How those first few site visits go will shape how we proceed, and help define who does what. Eventually we will apply for a grant, to help with the preservation and digitization aspects. It's an exciting project, just massive. I'm happy that the town is behind such a project, and that it is being coordinated by the library. Local history questions are often the most difficult to answer, and a project like this will go a long way to ensuring this information is both available and accessible to researchers and the curious alike. A few months ago I got an email about a website called Access NewspaperARCHIVE, saying that libraries could signup for free access to historical newspapers, dating back to the 1700s. Sweet. I'm always looking for good primary source resources, especially online ones (and especially-especially free ones), so I thought I'd check this out. The signup process was a bit odd, having to download and then fax in their signup form [pdf, 418 kb]. I didn't hear anything back from them for months, so one day I just tried their url again (from within the library) and it IP-authenticated me. So, my overall verdict is this: it's an amazing resource for primary source newspapers, and it's free, so it's better than nothing. There are some drawbacks, but I am rarely completely satisfied anyway. Something else I did like was they had a "Questions? Ask a Librarian" link. This is an email link to whatever email address you supplied on the signup form. Which is good, since my patrons using this will be able to write to me, instead of this company. Anyway, this is available, so I'm going to give it a try. If anyone has experience with this company or database, please comment below and let us know what you think. Thanks.